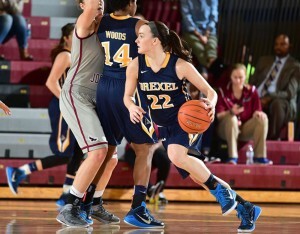 With only five league games remaining, the Drexel University women’s basketball team has been maintaining their successful overall league record (9-4). Women’s basketball player Meghan Creighton was named “Athlete of the Week” Feb. 3-9 for to her contributions to the team’s success. As a redshirt junior for Drexel, Creighton does not recall the exact age she began to play basketball. Creighton accredited her athleticism to her three older brothers, who all played basketball when she was little. All three brothers, whose ages range from 24 to 28 years old, played Division I lacrosse; they had their respective careers at Notre Dame University, Villanova University and the University of North Carolina. Although most people believe the Creighton’s are a lacrosse family, Meghan begs to differ. At Archbishop Carroll High School, Creighton had the privilege of playing with three future Drexel Dragons: Hollie Mershon, Rachel Pearson, and Sarah Curran. Creighton and Pearson, specifically, started playing basketball together in the fourth grade. In addition, their high school coach was Creighton’s father. To her, this means to be in every moment, whether it is on the field or off. For basketball, she strives to think about the play she is in, rather than thinking about the next. For life, Creighton appreciates what she is doing at the moment instead of worrying about where she has to be. This memorable motto also correlates to Creighton’s future goals. With a major in finance and a minor in communication, this senior is unsure of what the future has in store for her. “A major in finance will open up a lot of doors for me in the business world. I already experienced that through my internship at the Comcast Center in Center City,” stated Creighton. In respects to the basketball aspect of her life, Creighton does not wish to continue playing after her collegiate athlete career comes to an end after next season. With one full season remaining, Creighton looks back on her memories in a grateful light. Both her biological and Drexel family have been very supportive through her years playing, as well as last season when she was injured due to a torn meniscus, followed by a surgery. “Family is a huge part of my life, and that is my favorite part of this team,” she said. According to Creighton, the entire coaching staff is always available to provide helpful feedback. As the Colonial Athletic Association tournament quickly approaches, Creighton and the rest of the women’s basketball team are determined to make this season a successful one.